sign-wavers for Rep. Mike Honda. CONGRESS | 17TH DISTRICT | Following Saturday night’s eagerly-awaited first meeting between fellow 17th Congressional District Democrats, Rep. Mike Honda told reporters he will participate in a debate after the June primary. Honda’s campaign was unaware of the declaration when told of the congressman’s comments, but acknowledged they were prepared to negotiate dates for the fall, if both candidates finish in the top two primary this June. Vivek Kembaiyan, Honda’s campaign communication director, later confirmed Honda would debate whoever advances to the November general election. In addition, to Khanna, the primary includes Republicans Vanila Singh and Joel Vanlandingham. When told of Honda’s willingness to debate after month’s of questioning by the media, Khanna appeared surprised by the news and urged for 5-6 debates after the June primary focusing on specific issues such as education and technology. 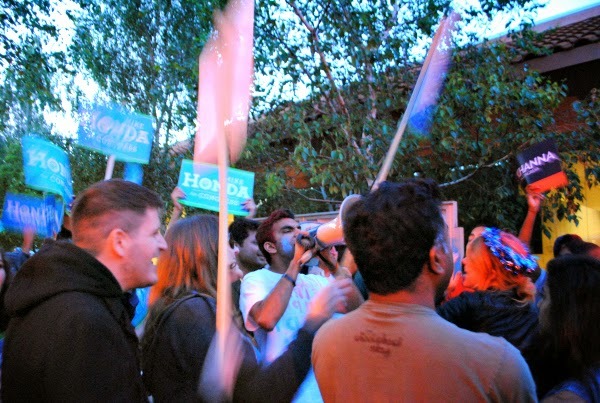 Saturday night’s candidate’s forum found few differences between Honda and Khanna, although both Democrats jostled over jobs, specifically, Honda’s claim of bringing jobs to the district through a federal grant for the BART extension to San Jose. Meanwhile, supporters from each camp held competing and raucous rallies outside the Fremont City Hall chambers about 90 minutes beforehand and resumed the chanting 30 minutes afterwards. Posted in CA17, candidate forum, debate, Fremont, June primary, League of Women Voters, Mike Honda, Ro Khanna, San Jose, Vanila Singh. Bookmark the permalink. None of us want to hear from Khanna. He's a joke. 1:19 AM is a joke. Khanna's told countless peeps on the inside that he just wants this gig for “the Power yo!”. He just wants to be an overnight sensation…without the years of hard work to build a base. Did you seee Honda's performance last night at the forum? THAT was a joke. Right, like Honda who's passed 1 bill in 14 years in Congress, falls asleep at his own townhall, and likes to take special interest trips every chance he gets. Real hardworker there. Anything can happen in politics, but i will stick with this thought: it is extremely difficult to defeat an incumbent member of the house of representatives. The only scenerio, is if the incumbent is completely mired in scandal, or just totally inept. Honda doesn't need to win any of these debates. He just can't say anything really foolish and thus newsworthy, like Pete Stark did over and over. No, Honda can come in second in every one of them. Few people see or hear about these debates. This debate produced no winner, because Ro Khanna did not create significant, noteworthy, differences. Time to regroup and find a hook. Too bad Honda isn't a grumpy old man like Pete Stark. Honda will take it. Khanna is a poser. Khana is just shopping every where to run for office. so when can we expect the Honda vs. Singh debates?